Get ready to fall in love with Cadillac. We love it when automakers decide to take shots at each other in advertisements. Companies like Hyundai and Audi have used billboards advertise their electric vehicles and troll Tesla CEO Elon Musk while Cadillac poked fun at Tesla's Autopilot in a commercial for Super Cruise. Even though it is fun to see automakers get catty with each other, Cadillac wanted to take a nicer approach for Valentine's Day. Instead of sending out mean messages, the American luxury automaker Tweeted out love letters to its competitors. Some of the responses are sure to make you laugh. Cadillac's message to BMW said "Is your GPS working? Because we're lost in your headlights." BMW even responded by saying "That's because our Angel Eyes are out of this world," to which Cadillac jokingly said, "Let's dim our headlights and see where this thread takes us." The exchange with Jaguar was even funnier. Cadillac simply said, "Meow," to which Jaguar responded, "Should we Escalade this to the next level?" Further along in the thread, Cadillac jokingly says "Oh Jaguar, you dog" and winkingly replies "Just don't leave scratch marks." The nice messages continued with letters to Tesla, Audi, and Mercedes. The message to Tesla said, "Dear Tesla, Can we Super Cruise into your heart?" 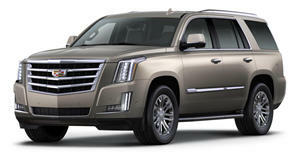 To Audi, Cadillac said, "Dear Audi, Say Escalade with that beautiful German accent." The message to Mercedes said, "Dear Mercedes-Benz, long distance can be difficult, but we can make it work." Sadly, Cadillac's message to Lexus wasn't as well-received. Cadillac tried to be nice by saying "Dear Lexus, We don't care what anyone says. We think your big grille is really attractive." Lexus obviously took offense because it responded by saying, "Aren't you a bit old for us? *swipes left*." Cadillac had a quick retort, saying, "You kiss your mother with that grille?" These exchanges made us chuckle and we can't wait to see if Cadillac pulls the same stunt on other holidays.